Kevin Nunn (“we”, “us”, “the company” “YourNewBooks”) runs the website www.yournewbooks.com (known as the “Site”) and may run other sites as well. YourNewBooks offers services (the “Services”). In order to access and use the Site and Services, you must agree to the following terms and conditions (the “Terms”). Please read the terms thoroughly. By visiting, browsing or using the Site, and/or using our Services, you are acknowledging that you have read these terms and agree to be bound by them. If you do not agree with any of the terms below, you may not visit our Site or use any of our Services. You must be at least 18 years of age to use our Site and/or Services. You are not allowed to create a derivative product based on our Site and/or Services. You are not allowed to use our Site and/or Services to violate any law (local, national, international), or harm anyone. You may not access our Site and/or Services using high volume or automated ways (such as robots). Once subscribed, you will receive an email Newsletter (from now on called “Newsletter”). By entering your email address and subscribing to the Newsletter (opting in), you are giving www.yournewbooks.com the permission to send emails. These email Newsletters are sent in bulk and by an automated email service. YourNewBooks publishes several newsletters by email per week. We call them “daily” to inform readers at sign up that they will receive about an email per day. However, there could be more or fewer emails per day in any given time period and delivery is not guaranteed. Each email newsletter you receive will also provide you with the option to share with others and/or to unsubscribe. The books on our site are not read by us. We feature them based on submissions we receive from authors and pick them based on whichever books we feel will be a good fit. We receive compensation from most, but not all authors in exchange for advertising their book(s). Authors will receive a special newsletter tailored specifically to them. By providing your email address and submitting your book for a feature, you are opting in to this special newsletter. The goal of this newsletter is to provide useful information to writers, as well as build a sense of community between authors by encouraging them to guest post in the newsletter. Each email newsletter you receive will also provide you with the option to share with others and/or to unsubscribe. YourNewBooks offers advertising from third-parties. We do not make any guarantees or promises regarding the advertised products or services. We do not guarantee that any third party product or service we advertise will be available or of good quality (including eBooks). We may offer products or services loosely related to, or unrelated to, eBooks through our Site and/or Services and in our email newsletter. The Site contains content which is owned by or licensed to us, including, but not limited to, the design, appearance, logo, copy and graphics. Reproduction is prohibited. Your feedback is welcome and encouraged. You agree, however, that when you submit any ideas to us per email, in person, as a comment on the Site, or in any other way directly addressed to YourNewBooks, you automatically forfeit your right to any intellectual property rights in those ideas and these ideas automatically become our property. YourNewBooks is an affiliate for Amazon, and may have other affiliations as well. When you click on a link in the email Newsletter or on our Site and make any kind of purchase, we may be paid a commission. We do not warrant that any and all info on our Site and in our Newsletter is correct. Please check the prices before making any purchases. Please return an eBook if you bought one by accident and do not wish to keep it. We can not guarantee that the Site will be up and running 100% of the time. YourNewBooks does not offer any warranties or any guarantees regarding the quality or content of any of the books. If you do feel that an author has misrepresented the content of a book, please know that you have the option to take advantage of Amazon’s return policy. Use of our Site and/or Services is at your own risk. We and/or our affiliates will be in no way or event liable for any damages related to the direct or indirect use of our Site and/or Services. Our limitation of liability is capped at $100 for the sum of all events that could have caused any damage. Do not use the Site and/or Servcies if you disagree. If YourNewBooks or some or all of its assets were acquired or if at any point YourNewBooks were to go out of business or enter bankruptcy, user information, (such as email addresses, emails to us, IP addresses if available, and any aggregated information) would be among the assets that are transferred to or acquired by a third party. By using our Site and/or Services, you agree that the acquiring party has the right to continue to use your personal information as stated in these Terms. Remember, that you will always have the right to unsubscribe if you choose. We reserve the right to modify the Site and/or Services at any time without notice. If you object to any changes to the Site and/or Services, your sole recourse will be to cease using them. Continued use of the Site and/or Services following posting of any such changes will indicate your acknowledgement of, and agreement to, those changes. We also reserve the right to discontinue the Site and/or Services at any time without notice. We will not be liable to you or any third-party should we exercise our right to modify or discontinue the Site or the Services. We reserve the right to terminate access to the Site and our Services for persons or entities without notice. The Site and Services can be accessed internationally, however, not all Services will be available to all countries. Also, in some cases, eBook deals and discounts may only be available in the US. International users are responsible to follow local and international law when accessing the Site and/or Services. If we ever do not enforce one or more parts or conditions of any of our Terms, this shall constitute no waiver. All Terms apply, even if not always enforced. If any part of these Terms is held to be invalid, all other parts of the Terms continue to be in effect, to the full extent permitted by law. We reserve to reject any book for any or no reason. Inclusion in the Newsletter and on the Site is not guaranteed. Even after you have received a confirmation email, including a featuring date, your book’s inclusion in the email Newsletter and on the Site it not guaranteed. If we do not feature your book, we will issue a refund upon request. We make no assurances or guarantees regarding the sales of your book. Your book needs to be at its sales price at 8 am EST on the date of its feature. If it is not at the price you stated in your submission, we will use the price as it is on Amazon.com as long as it is at $3.99 or below. If you use the Services and/or the Site, you are accepting the Terms. We may change these Terms from time to time. Any such changes will become effective when posted on the Site. If you do not agree to any part of the Terms, you must discontinue use of the Site and the Services. If you continue to use our Site and/or Services after changes to the Terms have been posted, you acknowledge that you agree to the updated Terms as well. 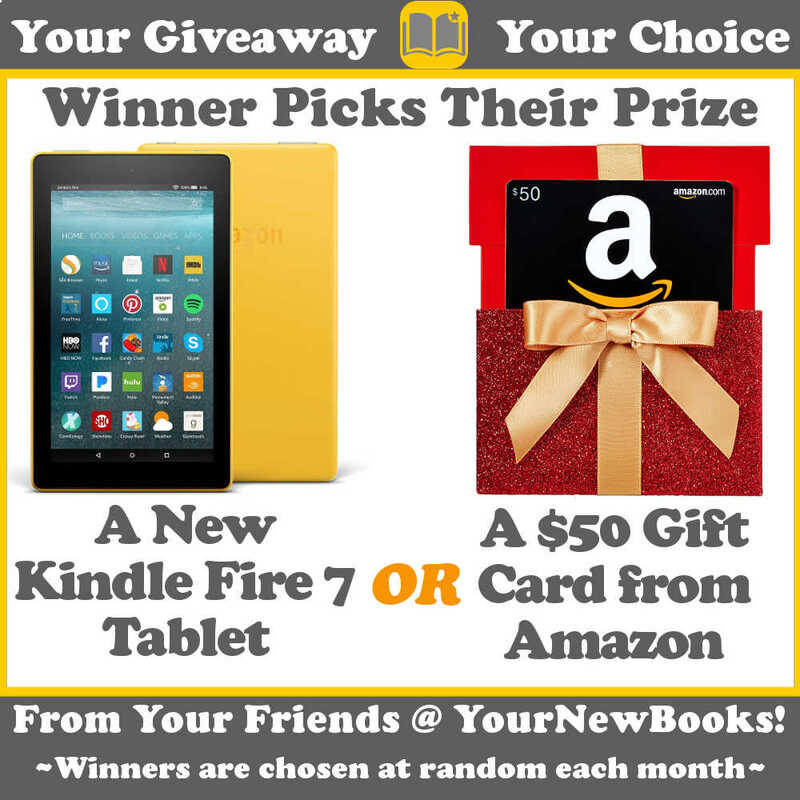 Enter our “Your Giveaway, Your Choice” Giveaway today!